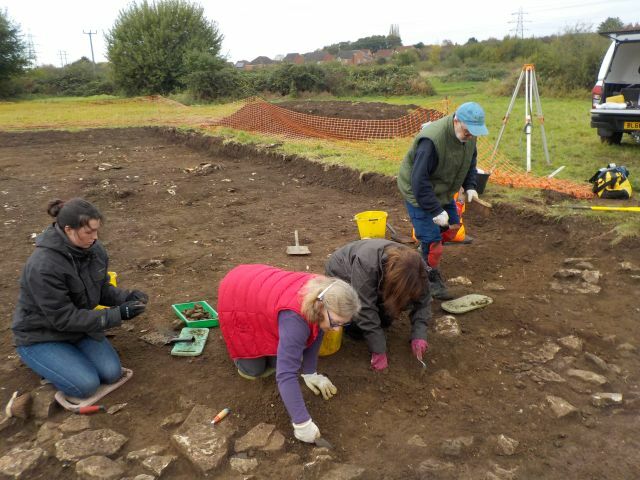 Volunteers from the Irthlingborough Archaeological Society, in conjunction with staff from Oxford Archaeology and with support from the Wildlife Trust for Bedfordshire, Cambridgeshire and Northamptonshire, were investigating the remains of a Roman settlement to the south of the modern town. A geophysical survey had revealed the outlines of enclosures, which, when the topsoil was stripped away, were found to contain buildings with stone foundations. The stone block was found close to one of the buildings. The surface of the block is highly worn, but shows a sea creature and human figure. The tail of the creature is clear, and the human figure either sits astride the body of the creature (Neptune riding a hippocampus, perhaps; there is a hint of the neck of the horse-like beast to the left of the human figure) or is joined to it to form a single creature, such as a triton. One arm of the human figure appears to be raised, while the other arm is pointing down and carries what could be a trident. The condition of the relief is very poor, however, and without further examination, the detail and interpretation remain uncertain. The block is of Roman date and had been part of a monumental structure, possibly a tomb or shrine. The site is located on the opposite side of the Nene valley to the roadside settlement of Higham Ferrers (excavated by OA), where monumental stonework has been recorded. Remarkably, the block was found with the carved side face down. Had the carving been uppermost, then it may not have survived the later ploughing to tell its tale.